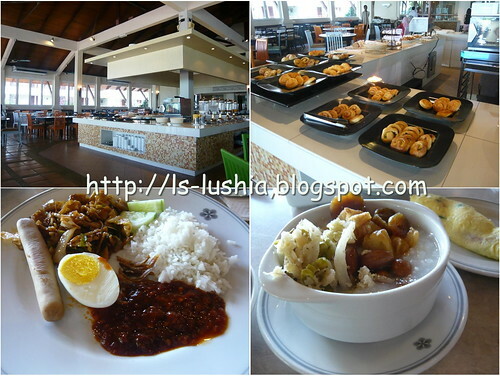 The 2 days 1 night stay at Swiss Garden Golf Resort & Spa, Damai Laut includes breakfast at The Garden Terrace Restaurant! An escape from city to seaside! 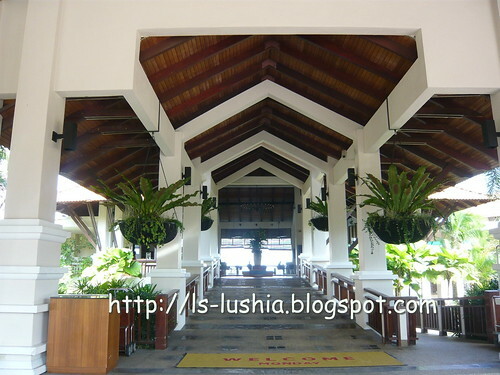 Stayed at this resort in March 2010. Here's a brief introduction for everyone. 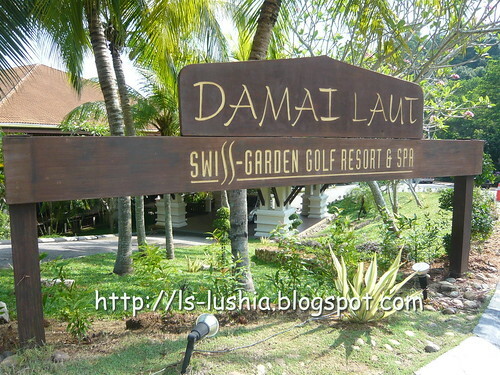 Damai Laut Swiss Garden Golf Resort and Spa is an exclusive resort with 300 rooms, acres of golf course and a private beach located at (Manjung District) southwestern part of Perak, Malaysia. 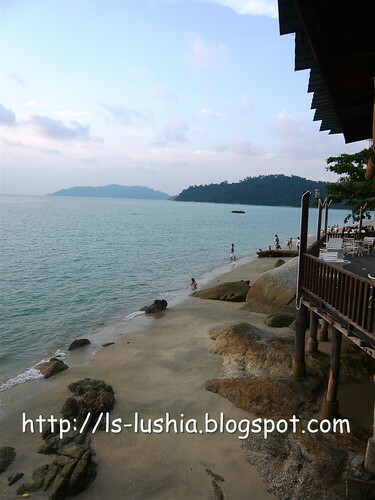 The hotel provides Pangkor Island drop off as well. 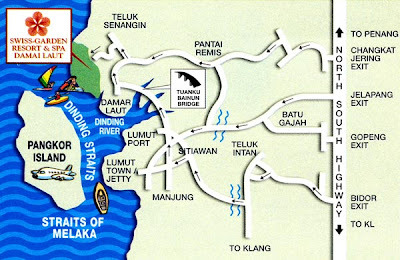 Instead of traveling all the wait to Lumut for a ferry to Pangkor Island you can book a private boat to travel across and if I am not mistaken, they do have snorkeling packages as well. 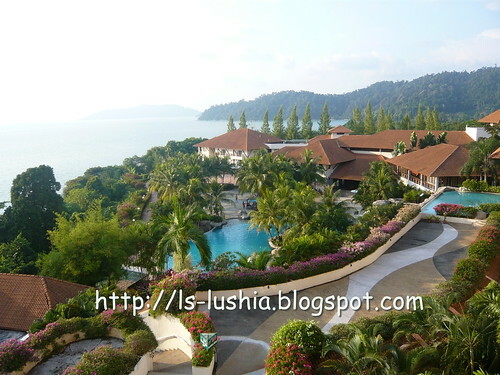 There is nothing much to do at this resort ... it's a private resort for recreation and relaxation... with breathtaking sunset view! Few months back, sis and bro in law brought me to YI TANG CAFE & RESTAURANT , a newly opened steamboat house in Melaka Raya for dinner. 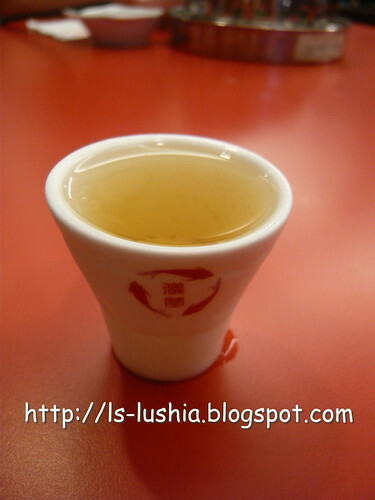 Upon seated, a small cup of sour plum juice is served before the meal. 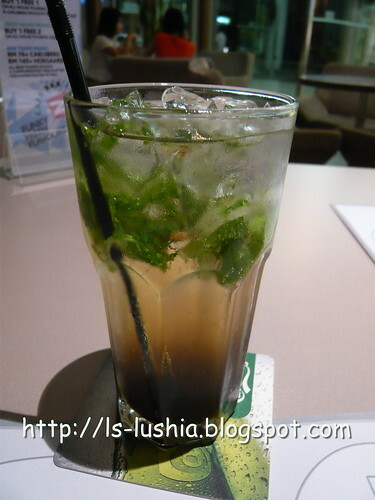 Am wondering if this is Umeboshi juice, juice made Ume plum ( a Japanese plum) . It is claimed that it helps to increase one's appetite. Nice.... can I have more please?? Fresh but small portion of ingredients. 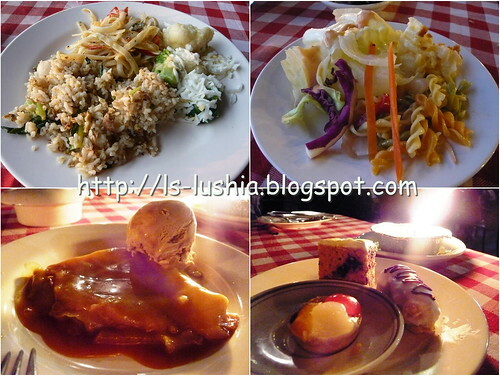 I am considering that as small portion... not sure if you have the same thoughts as well. And then, you get to choose your preferred soup base. A small pot for each of us! 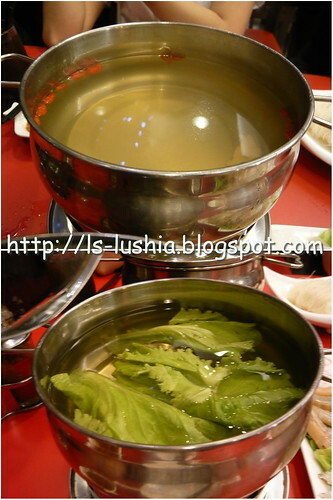 We had one herbal soup base, two clear soup base. Both option seems to be satisfying- Light and tasty! 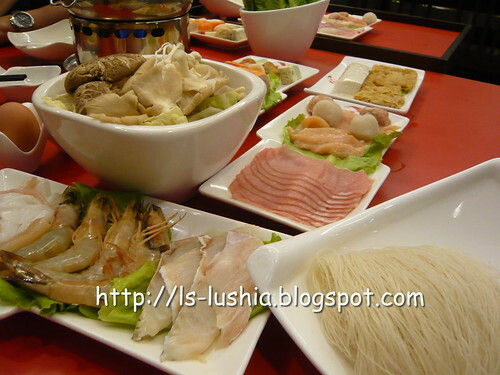 Put in all the ingredients while the hot pot is kept simmering. And start eating when it's cook. Don't forget the dipping and chilly sauce! 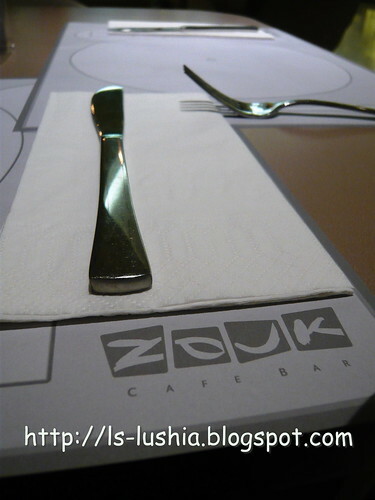 Nothing fascinating... just another dining experience to share. Malaysian palate is unique! 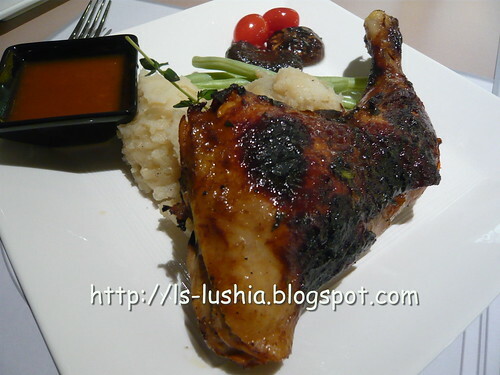 Malaysia, a country with 13 states and diverse nation has it's own identity for food. 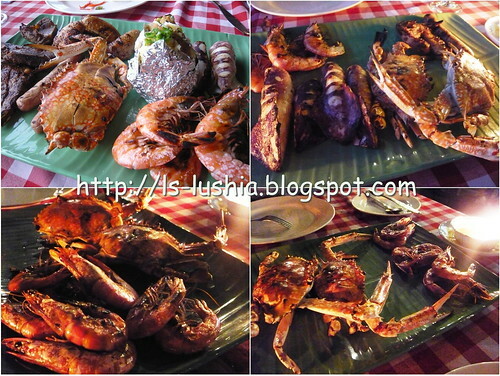 Different cuisine/food epitomized the beauty of each state. As for The Historical State, besides satay celup and chicken rice balls, the Peranakans (Nyonya) cuisine symbolizes Malacca. 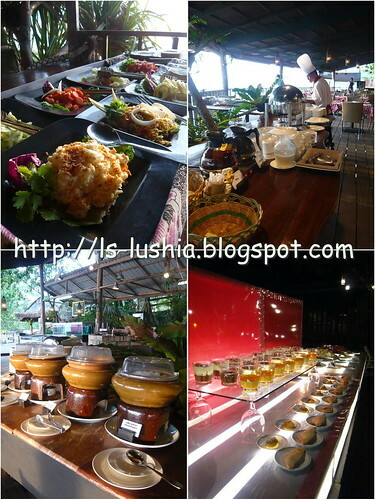 And it's definitely a must to savor Nyonya cuisine if you are in Malacca. 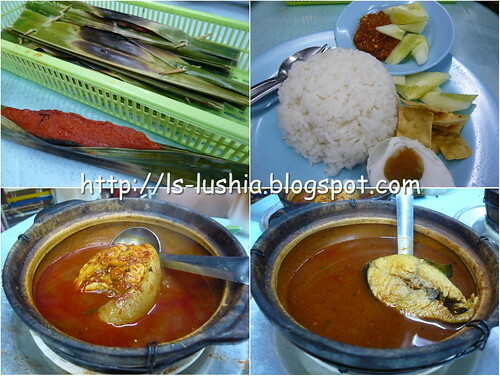 One can easily find Nyonya cusine at Jonker walk, and if you don't like the crowd.... here is another suggestion for you! A calming coffeehouse with an antique theme and minimalist interior. What's commando chips? Chips prepared by the commando of a military- Of course not! Perhaps the dish is named for it's "Uumph"! Just like a commando! In fact, it's a great plate of snack! 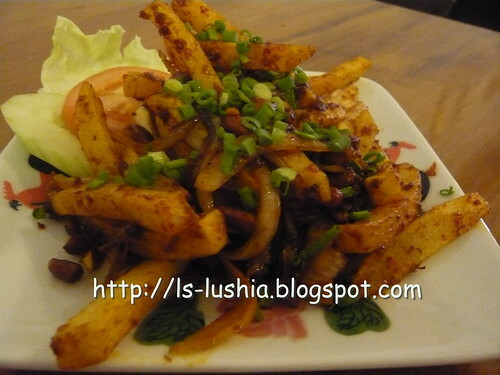 Stir frying french fries with crunchy anchovies, peanuts, onions, lime juice and chilly paste. 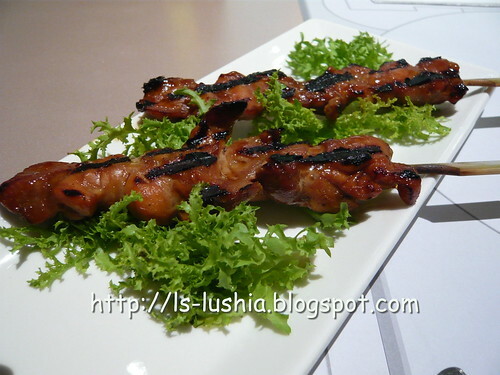 The sweet,saltish, spicy and and savory combination definitely teases one's taste bud! 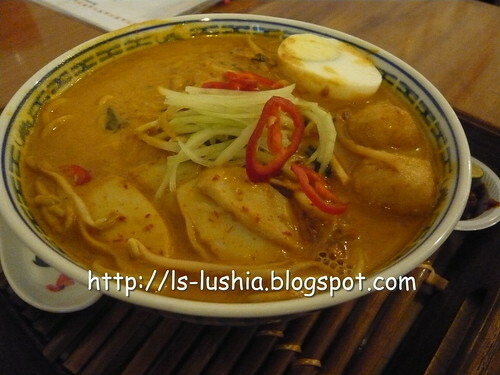 Noodles with thick and spicy coconut gravy served with eggs, fish cakes and chilli paste. The best try of the day! 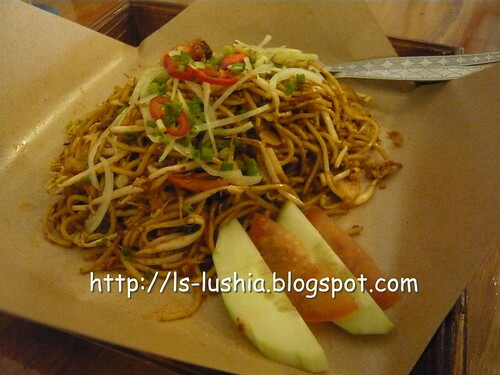 A perfect plate of spicy fried noodles with crunchy bean sprouts! 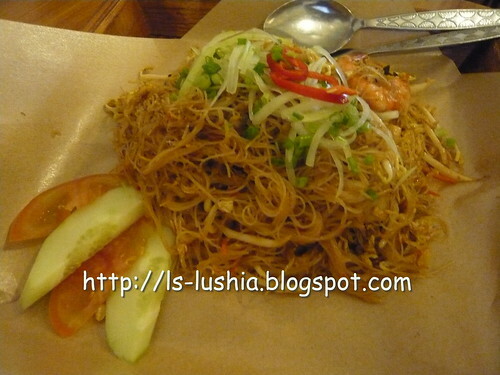 Mee Siam or Bee Hoon Siam is NOT one of the Nyonya cuisine- this sweet sourish fried vermicelli dish originated from Siam- Thai. Mee siam has been adopted by most of the races in Malaysia and Singapore, hence there are a few different version of Mee Siam- fried version, indian version, malay style version. 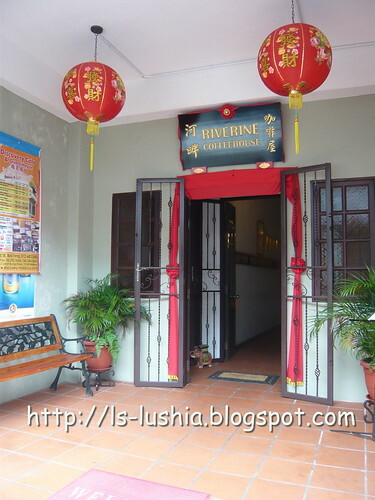 At Riverine Coffeehouse, they served the fried version instead of the traditional mee siam. I Personally prefer the traditional version, fried spicy vermicelli served with sweet and sourish tamarind sauce. I guess Mag ( my sister in law) prefers the traditional version as well. Riverine Coffeehouse serves western food as well. 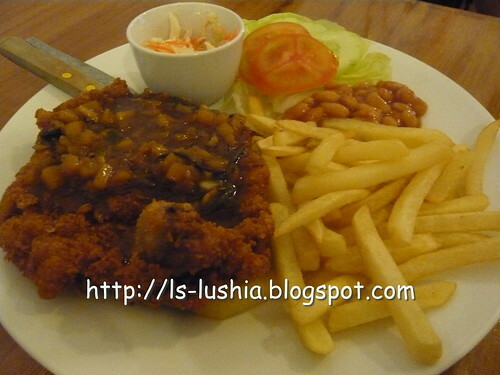 Mama Mollys Chicken Chop- deep fried chicken thigh served with sauce. 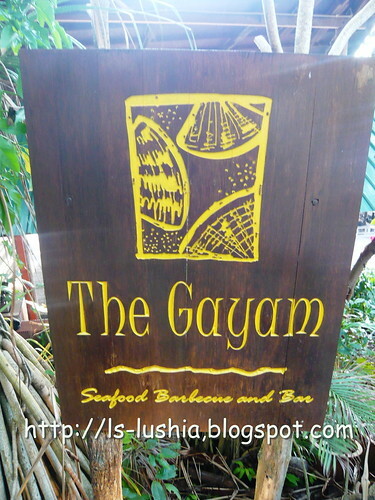 Suggest to try the local delights instead of chicken chop or western food! The coffeehouse is located along the Malacca river with a perfect view of Venice of the East! 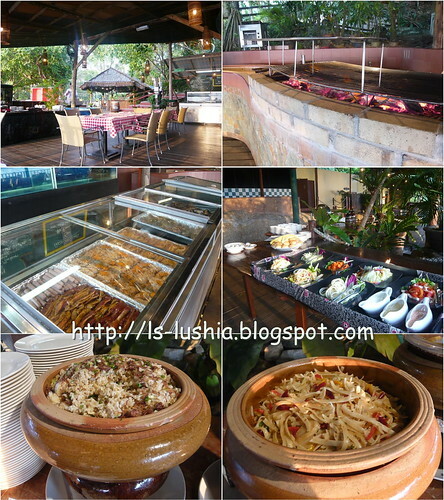 They serves not only authentic Nyonya cuisine but also Hainanese Colonial Food as well as western food. It's Also a good place for a beer or two! 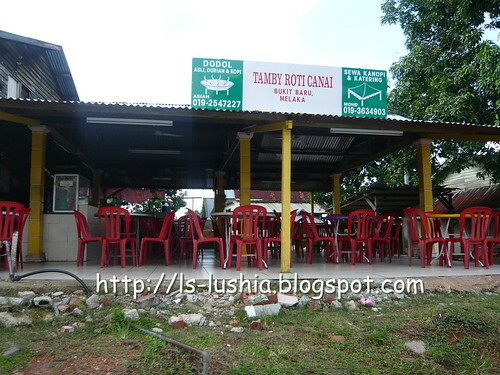 So our next session for supper is at Tamby Roti Canai! Bro was grumbling like an old man when I mentioned that I need a second round for supper. At the same time, sis in law was nodding in agreement with me. Mag was mentioning roti bulat- sedap! Roti bulat by Tamby is good! So, what is roti bulat? It was quite crowded when we arrived. Luckily, there is a table untaken! So what's roti bulat? Roti bulat= roti kosong in round shape It takes a longer time to prepare and it's true, it tasted must better! Love the aroma of the butter used and the texture of the bread is soft and yet crispy. As for Roti Tampal & Roti Telur, bread texture is soft as well. But it's not as aromatic as Roti Bulat. Well, probably it's the amount of butter used and the length of time to flipping the flat bread on the hot griddle? Roti Canai is a type of flat bread found in Malaysia and this dish is believed to be originated from Chennai, India(formerly known as Madras). The word "roti" means bread in Hindu and Malay and the word "canai" is believed to derived from the word Chennai but in Malay, "canai" means "to flatten". 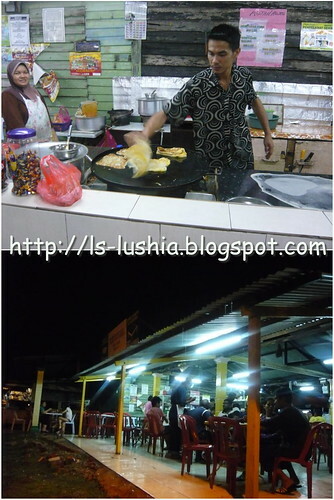 Hence, the derivation of the name and meaning of the dish, Roti Canai is still ambiguous. 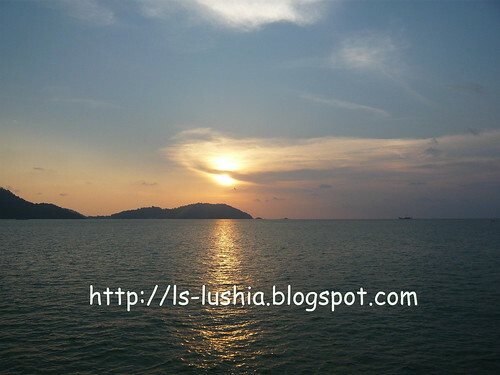 I was back to Malacca last April and went for two supper session ( within 1 hour) with my brother and sis in law. My first visit to pasar borong was 9 years ago! I was there for Kopi-O with my grandma and uncles. After 9 years, I revisited Pasar Borong for Asam Pedas! Nothing overpowering. 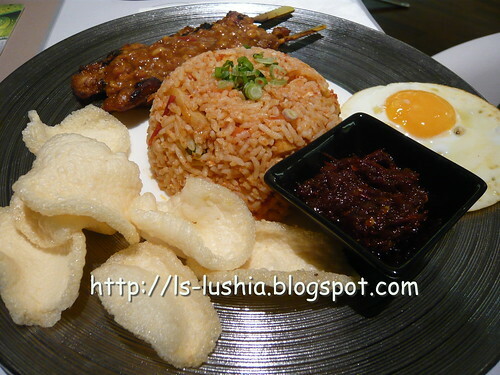 Taste wise, just nice..... the sambal belacan was good ! Next supper session- ROTI CANAI!! "What's for lunch? What's for dinner?" "I don't know, you decide.... "
"No! 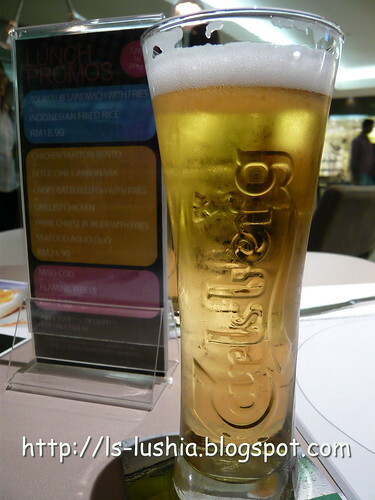 I have no idea", you decide..."
At Ko Hyang 故鄉 you can enjoy appetizing Korean cuisine at cheap/reasonable price. 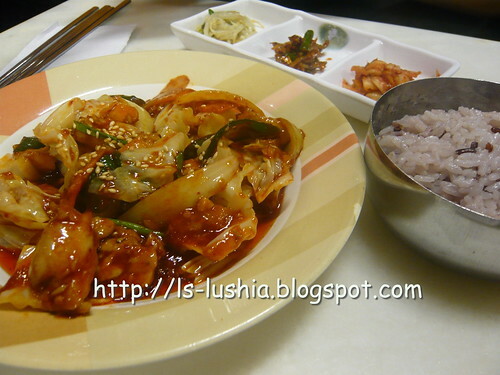 Ko Hyang 故鄉 Korean Country Delights serves simple country style home cooked Korean dishes. Bi Bim Bap literally means mixed rice. 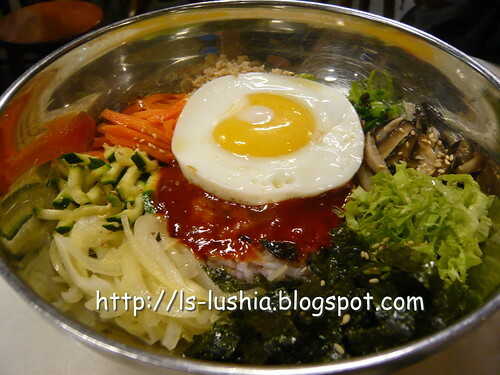 It's a popular korean cuisine- a bowl of white rice served with namul (various sauteed vegetables) and gochujang (chilli pepper sauce) and topped chicken/beef and fried egg. Toss.. toss.. toss... GET SET.... GO!! 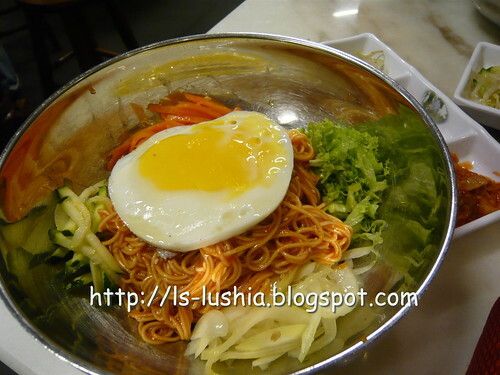 Yummy.. yummy..
Also known as Bi Bim Guk Su / goldong myeon is a cold sweet and spicy noodle dish. Spice loving people like me loves Bi Bim Kuk Su. Thin wheat flour noodles seasoned with red pepper powder, chilli pepper sauce flavored with vinegar, sugar and sesame oil. Appetizing! 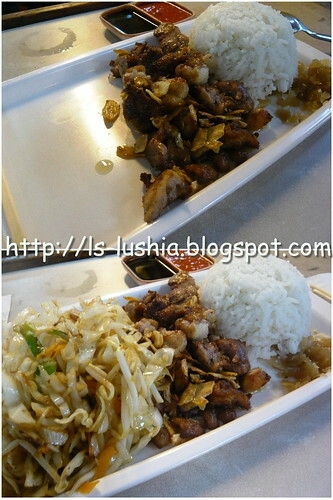 Dak Bokem,stir fried spicily marinated chicken with vegetables and rice. 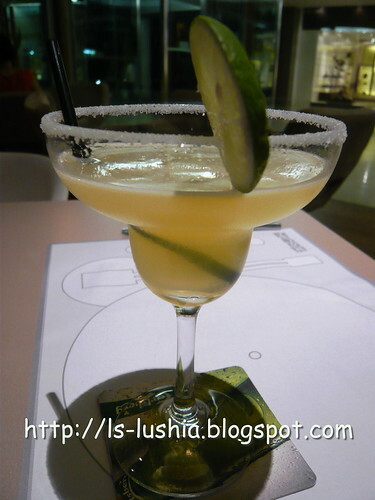 Love the sweet, hot spicy taste- flavorsome & appealing! At Ko Hyang, rice served are rice cooked with black glutinous rice- a little sticky but aromatic. It's my all time favorite!! 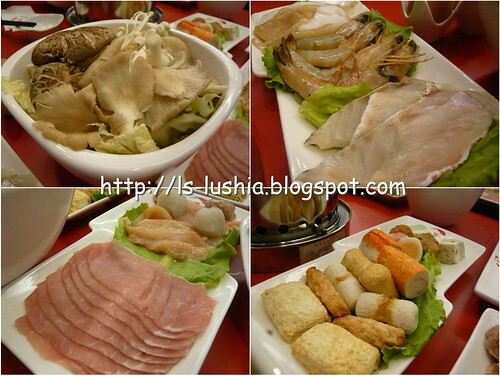 There is another place that I revisited again and again for their Sun DU Bu Ji Kye- will post about it next time! 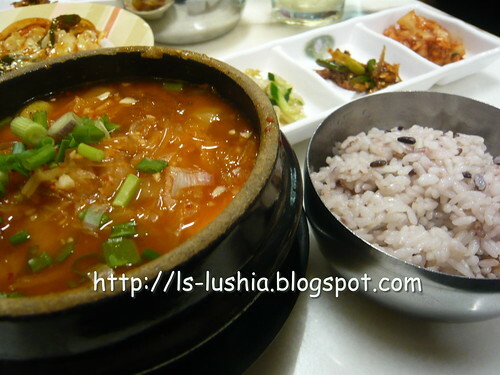 Sun Du Bu Ji Kye/ Sun Du Bu Ji Gae, another well known Korean stew is prepared with dubu (tofu), seafood, vegetables and gochujang with other ingredients. A raw egg is added into the bubbling broth that heightens the richness of the stew. Ko Hyang 故鄉 definitely has a tantalizing story of Korean Country Delights to lust after! By the way, it's HALAL! 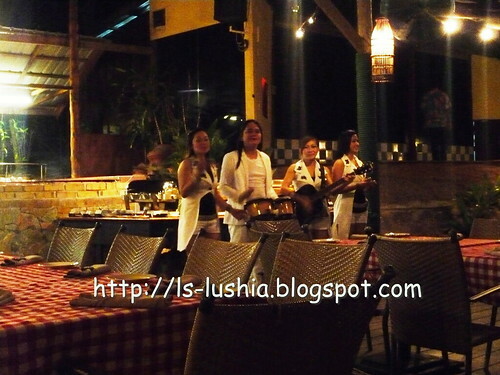 Teppanyaki, is a worldwide known Japanese cooking concept. It's a one of a Japanese cuisine, where raw ingredients/ food are fried on an iron griddle. Teppan literally means 鉄板 -iron griddle and yaki indicates grilling. Well, here is another suggestion for everyone! 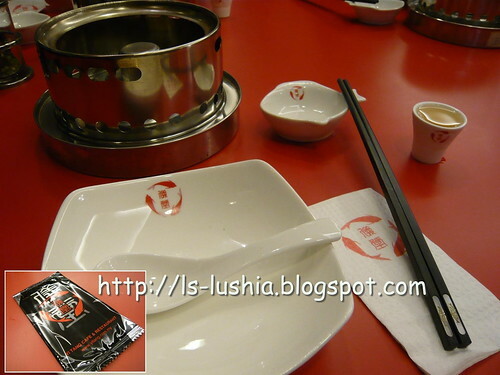 If you happen to be in Sg Wang plaza, Try Teppanyaki! Teppanyaki used to be a place that we often go for lunch BUT NOT for Teppanyaki. 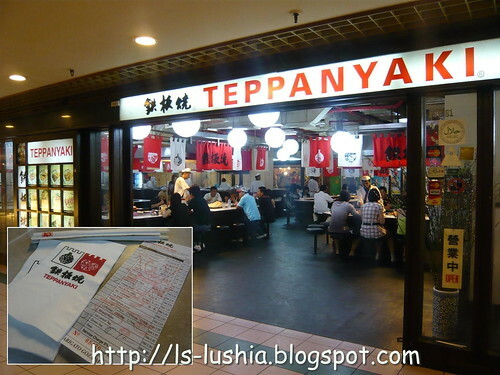 The explanation - We used to visit Teppanyaki for chicken rice! 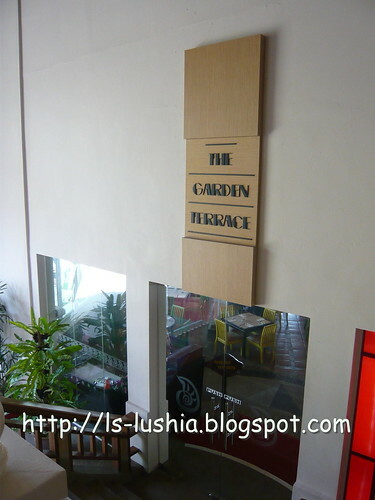 To the left of the restaurant, there is a corner for chicken rice. It think it's run by the same owner of Teppanyaki- am not so sure though and never intended to ask. Tried Teppanyaki only after we(office) moved out from the Golden Triangle area. 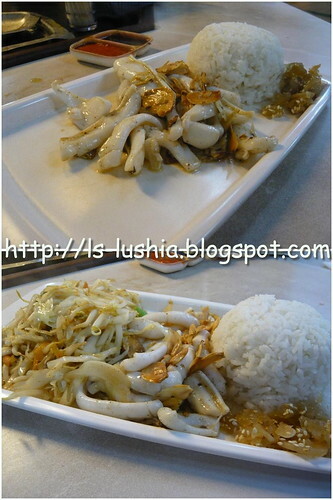 Wonder why it's named as cuttle fish yaki?? And, of course, it's better than Mr. Teppanyaki!! Okay, I admit- I dislike Mr Teppanyaki very much, !! 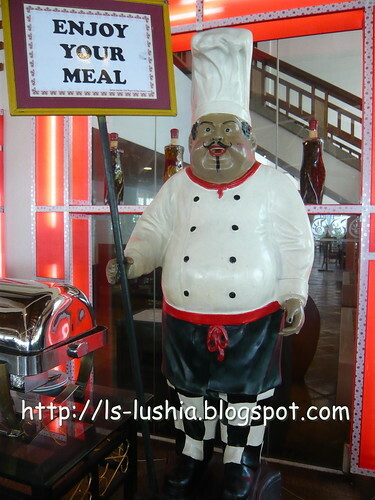 But, if I were to compare Teppanyaki & Mr Teppanyaki- Teppanyaki is much better ( for me)!